Wednesday afternoon, a little after 2pm, Felix Hernandez backed up what he's been saying all along. He signed a 7 year deal worth $175 million dollars to stay in Seattle. That's a pretty good chunk of money going to a pitcher who, after Ichiro departed last season, has become the face of the franchise. Whether or not he's worth the sort of money he's getting isn't for me to say, or anybody else for that matter. As far as I know, seeing into the future is not yet a thing. Opinions will be thought, written, discussed and yelled from the rooftops, which is all well and good since opinions are just that, opinions. Speaking of money, the contract details are after the jump, thanks to Ken Rosenthal. If you want to get all teary-eyed and goosebumpy, Lookout Landing posted the press conference video for those of us who were either asleep because we work nights or were at work because they're normal. Between the annual salary and a $6 million signing bonus, the total comes to $175 million over 7 years. That's a lot of money and a lot of years, but for a pitcher who is one of the few aces in the major leagues. Not only that, but for a guy who actually wants to stay with Seattle his whole career. 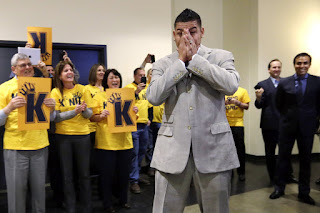 What the Seattle Mariners have done to deserve such loyalty from a player of his caliber, I have no idea, but I think now would be a good time to tell him he really did sign with the 2013 Seattle Mariners and not the 2001 Seattle Mariners. But wait, there's more! Everybody heard about the elbow "issue" that isn't really an issue pop up, which may have delayed the signing for a day or two. If the issue was a major concern, I don't see the Mariners signing Felix for 7 years. During the physical, it's possible the doctors who were looking at the MRI results saw some normal wear and tear and decided a little protection for the club was in order. Actually, I doubt the doctors care whether or not the club decides to get protection written into the contract. I assume they relayed their concerns and because the internet is the internet, an elbow issue became something for all Mariner fans to have a collective heart attack over. In the time leading up to the official signing, there was language placed in the contract to protect the Mariners in the event of a catastrophic failure of some specific elbow injury. It's important to note that the protection is limited to the elbow in question and not any other injury. Basically, if Felix has to have Tommy John surgery, Seattle is protected. If he tears a rotator cuff, Seattle is pretty much screwed. The only downside is that, if that happens, the year that would be considered a make-up year, Felix would be 34 years old. I'm not saying it's a crappy provision, just that it wouldn't be ideal. Of course, Felix having to go under the knife for anything wouldn't be ideal either. No matter how you look at it though, this was a deal to keep Felix in a Seattle Mariners uniform for the prime of his career and on the other side of that peak. I don't doubt that he'll get another extension in the years to come, keeping him in Seattle for his entire career. Some may argue that you'd think he would have given the Mariners a home team discount. I'd argue that by staying, he already has. If you've watched the last few seasons, having any player want to stay in Seattle, let alone a player of Felix's caliber, is unheard of and could be considered miraculous. Also in the contract is full no-trade protection for Felix. None of this block of 10 teams to try and get more money if he's traded to them nonsense. Felix wants to stay in Seattle and will for the length of the contract. That doesn't mean he won't waive it at some point in the future, but right now that's a very unlikely scenario. So we should be free of the "Seattle should trade Felix" crowd for at least spring training of this year. Maybe even the first month or two. One thing we know for sure though. Regardless of what anybody else thinks, Felix Hernandez is here to stay because both he and the team wanted it to happen. He has made Seattle his kingdom and the fans rejoice. Long live The King.